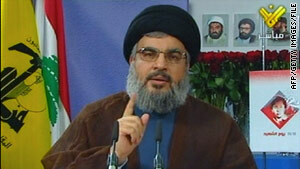 Hassan Nasrallah, seen in an earlier speech, said Monday Hezbollah is a resistance force rather than a terrorist group. Hassan Nasrallah unveils group's new "manifesto"
Beirut, Lebanon (CNN) -- Hezbollah's chief on Monday announced the group's new "manifesto," which calls on all countries to "liberate Jerusalem" and declares the United States a threat to the world. "American terrorism is the source of every terrorism in the world," Hassan Nasrallah said in a televised speech from an undisclosed location. It was his first address since a unity government formed in Lebanon this month, ending a crisis that had left the country with no government since June's parliamentary elections. Hezbollah, a political party in Lebanon, is listed as a terrorist organization by the United States and Israel. Nasrallah does not appear in public amid concerns for his safety. "We invite and call on all Arabs and Muslims and all countries keen on peace and stability in the world to intensify efforts and resources to liberate Jerusalem from Zionist occupation and to maintain its true identity and its Islamic and Christian sanctities," Nasrallah said. Hezbollah has claimed responsibility for numerous terrorist attacks. It has been linked to attacks against against American, Israeli and other Western targets. In his remarks, which included about 80 minutes of reading the manifesto followed by answering questions from reporters, Nasrallah sought to reject the "terrorist" label, repeatedly saying Hezbollah is a "resistance" force. "The U.S. administration under President George W. Bush equated the concepts of terrorism and resistance to deny the right of resistance for the people," he argued. He praised Iran and Syria, which are Hezbollah's chief backers. "Iran plays a central role in the Muslim world" and "stood with courage and determination with Arab and Islamic issues, especially the Palestinian issue," Nasrallah said. "Damascus stood with and supported the resistance's movements in the conflict. We emphasize the need to adhere to the distinguished relations between Lebanon and Syria," he added. A battle to end Syria's occupation of Lebanon led to protests and confrontations in the streets in 2005, which was labeled the Cedar Revolution. Syria eventually withdrew its troops from the country. In his "manifesto" Monday, Nasrallah also touched on domestic issues. "We want a government that works for its citizens and provides the appropriate services in their education and medical care and housing to secure a decent life and to address the problem of poverty and provide employment opportunities," Nasrallah said. "We want a government that works to strengthen the role of women in society and enhance their participation in all fields," he added. Nasrallah also called for Palestinians in Lebanon to "be given basic human rights which at the same time protect their identity and their cause." Under Lebanese law, Palestinian refugees have no social and civil rights, limited access to public health or educational facilities, and no access to public social services, according to the United Nations Relief and Works Agency. "The majority rely entirely on UNRWA as the sole provider of education, health and relief and social services," the agency says on its Web site. "Considered as foreigners, Palestine refugees are prohibited by law from working in more than 70 trades and professions. This has led to a very high rate of unemployment amongst the refugee population." More than 422,000 Palestinian refugees are registered with the agency in Lebanon, the group says.